Meet our representative upon arrival in Delhi and check-in at the hotel. India’s capital & a major gateway to the country, Delhi is contemporary and a bustling metropolis which successfully combines in its fold the ancient & the modern. Its strategic location was one of the prime reasons why successive dynasties chose it as their seat of power. New Delhi also reflects the legacy the British left behind. Overnight in Delhi. After breakfast, proceed for a full-day tour of Old and New Delhi. This fascinating city has been in existence since the 6th century BC and has seen ups and downs from the rule of the Pandavas right up to the British Raj. Visit Jama Masjid, which is the largest mosque in India, commissioned by Emperor Shah Jahan. The courtyard of the mosque can hold about 25,000 worshippers. Enjoy a rickshaw ride in Chandni Chowk, the busiest market in Old Delhi…noisy, chaotic and uniquely Indian. You will then drive past from the Red Fort, which was constructed during the rule of Emperor Shah Jahan and served as the residence for the Mughal royal family. It continues to be significant till date, as every Independence Day, the Prime Minister makes a speech from its ramparts as the Indian flag is hoisted. Later, drive past President House and several other government buildings in Edwin Lutyen’s Delhi before you head toward Rajghat, the memorial to Mahatma Gandhi. This simple memorial marks the spot where Mahatma Gandhi was cremated in 1948. Thereafter, visit Humayun’s Tomb, commissioned by Humayun’s wife Hamida Banu Begum in 1562. It was the first garden tomb built in the Indian sub-continent where the Persian architect used red sandstone on a large scale. Later in the evening visit the Qutab Minar, which is the tallest brick minaret in the world; it was commissioned by Qutbuddin Aibak, the first Muslim ruler of Delhi. Overnight in Delhi. After breakfast, drive to Agra. Arrive and check-in at your hotel. Later, proceed for proceed for Half Day City Tour of Agra. 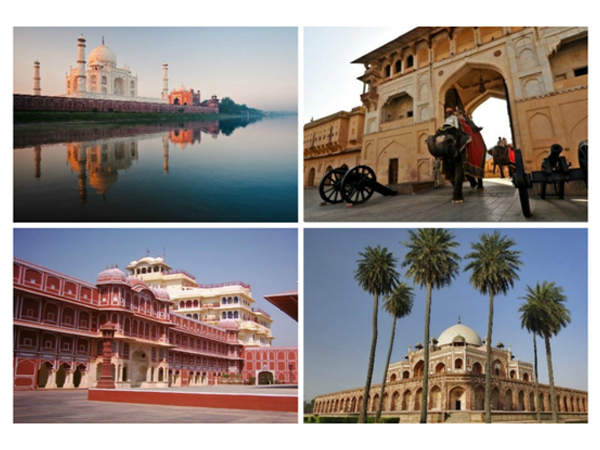 Visit the Red Fort, which was commissioned in 1565 by The Mughal Emperor, Akbar. The beautiful yet forbidding structure is a handsome example of Mughal architecture. Later, visit the Taj Mahal … a mausoleum built as a symbol of Emperor Shah Jehan’s devotion to his beloved queen Mumtaz Mahal. Considered an architectural marvel, its construction took thousands of workers over 21 years to complete. Overnight in Agra.